Ruth Taylor was born in London, England and attended schools in Surrey and Buckinghamshire. Prior to studying Architecture at University of Westminster she studied English Literature and Language at University of Liverpool followed by four years working for an investment bank. Before joining SCABAL, as a Senior architect in 2008, she worked with Cottrell & Vermuelen Architecture, Sarah Wigglesworth Architects and Dinwiddie MacLaren Architects gaining particular experience of Education projects as well as working on community, arts, conservation and residential buildings. Ruth frequently works on the early stages of projects developing briefs and managing dialogue with client groups and stakeholders. She has been a key member of SCABAL’s Client Advisor for London Borough of Camden’s Building Schools for the Future programme (BSF) and currently advises the school and local authority on Hawley Primary School for Camden. Tell me about an early school you attended. The one I remember most clearly was a junior school that was quite new when I went there in the late 1960s. The classrooms were individual little brick houses with their own toilets and their own little cloakroom: a completely free standing classroom with grounds arranged around it. You had a distinct sense of your own classroom, even though they were identical. And you moved from classroom to classroom as you changed year. The desks were all set up facing the blackboard and there was a little area around the corner, just before you went into the cloakroom, where they had sinks and worktops. There was a whole wet-area, basically. And the room was spacious. No, I learned to read before I went to school. Were there places to read inside the classroom, like a book-corner? I don’t remember a place to go and read and, as someone who never had a problem with reading, I don’t think I would have noticed that really. There was a library in the school. And the library was in the foyer in the school. You had to queue up in your dinner queue next to the library, so I think you might have chosen to go there at dinner and break times and you were probably taken there occasionally but it wasn’t somewhere you were taken in class-time usually. What prompted you to study architecture? When I was in my teens I wanted to study architecture. I did my work experience when I was at school in an architect’s office, so I retained the idea that that was my future right up until I was 16 or 17. I chose to do A-level Art on the basis that I would study architecture, but then it faded away again and English was by far my best subject at school so I just sort of fell into that. After my English degree I worked in an investment job as a ‘macjob’ in the 80s, because I didn’t know what to do but I met various architects over the years and each time I thought ‘Oh, I wish I was doing that!’ After four years I took redundancy, went travelling for a year and came back to study architecture at Westminster. Was your architecture education a very different experience from your degree in English? It was extremely different from being an English student. Although I’d built up an ideal of it, I’d never focussed on what it was really going to be like and it was considerably harder than I’d ever expected. When I studied architecture, it was something I was determined to put myself through, more than something I was looking forward to. I’m not a very good decision-maker and architecture is really about making decisions very quickly and doing something with them. Making the decision always used to be so very difficult for me that it would be half-formed by the time I got to it. I have never really mastered that but it was a real struggle for me all the way through university from that point of view. Probably I should have been mature enough to realise it was all about how to pass the exam, not about how I felt. How did the architecture training prepare you for your career as an architect? It did prepare me well. The English system is quite good because you learn most of the technical aspects and the machinations of how things work and what the processes are on the job. And when I hit that moment I was really good at it. In terms of design processes at university, although it is largely quite theoretical, it does actually reflect the real design process quite well: it doesn’t differ much from the professional design process. So it is a good training. I don’t think there’s anything more you could do, though I imagine a little bit more of an integrated approach to the technical aspects rather than them being ad-hoc to the design process might have been useful at an earlier stage. You’ve done a lot of work in schools, did you have any training in how to work in schools? I learned that entirely on the job, although I had a very good friend with a practice that specialises in schools and I did some work-experience in the holidays with him which was schools all the way. The BSF (Building Schools of the Future) programme was just starting in Britain at about the time when I came out of architecture school and got my first job so I was into that quite quickly, even though the firm I was working for initially didn’t really specialise in schools at all. 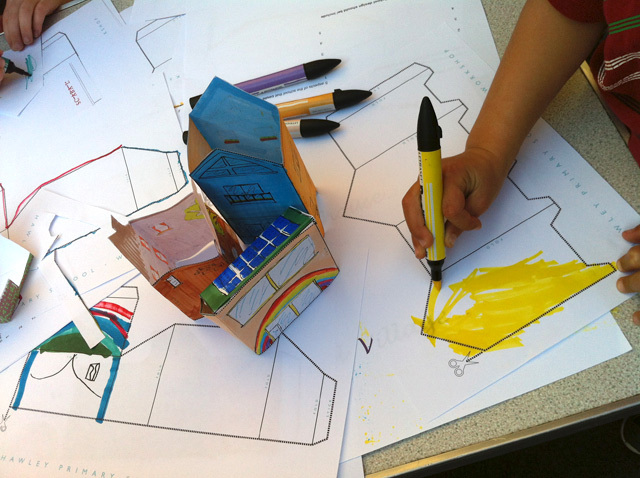 How would you describe the architect’s role in school procurement? Well, schools are full of people who are under quite a lot of pressure and they generally have quite strong ideas: they’re not always speaking in unison and there’s quite a lot of them. Not to mention the children! I’m talking about the strong teaching and administrative hierarchies in schools. As an architect, a lot of the work is about dealing with those personalities rather than the children and the children are given to you occasionally. But, wherever I can, and sometimes under the guise of observing the daily routine, I’ve done observations of children as well. And I think that helps. Asking children directly about what they want in different rooms during the briefing process is all very nice but you have to manage that and I’m sure the teachers are wary of you doing that to some extent because although even they sometimes think it’s a good idea, you don’t come out with very much unless you’ve managed the process in advance and thought about what you want out of it. A child could say anything about what they want in a room or a space and if they want it to be more like a fairground, for example, there’s only so much you can find that is useful. So observation is sometimes better. Perhaps there is more value in getting direct responses from older children but with younger children you have to look at how they are responding to spaces. When you are dealing with a head teacher in a school, do you go in with your own vision of what’s possible and practical? No, I think as practice we aim to start with what they want. And that’s where that observation also comes in. After a while you get to know their daily routines. You’d think that all schools are the same, but their daily routines are often quite different. When you say that you ask them what they want, are you thinking about pedagogy? Sometimes it is about the vision of a particular head teacher. I suppose there are some things that are the same in most primary schools in terms of the organisation of the day and so forth, but staff members and, to a certain extent children have expectations of how spaces will work and that does vary quite a lot. To a certain extent, you have to interpret the teacher’s visions with understanding because on the whole adults, like children, only respond to spaces that are similar to spaces they have seen before and often don’t even have that much experience of many workplaces. Certainly, staff don’t really acknowledge their experience of places that aren’t schools when they are being consulted, so actually describing how a school should be starts with how a school already is. Many staff have probably never worked out of the classroom apart from their teacher training. So sometimes we have to give them ideas about other spaces to help them. How do you prepare everyone for the inevitable compromises that will happen between the design and the realisation of the school building? Architecture at the later stages of design, especially during construction, can often be a process of removing things and making compromises. The way that the whole school procurement process works with pressure on time and money is the reason why things are constantly removed. My role as a client advisor is to represent the school’s ideas and be on their side; so to manage which of these changes are allowed happen. My inclination is to give them as much of what they want as they can get and sometimes it’s very difficult not to fight all those battles on their behalf even though you know you’re going to lose some of those battles. That’s a rod to beat myself with because actually I should manage their expectations a little better. But by the time we get to that stage of the process, they’re usually very stressed about it and I want to give them as much of what I’ve promised them as I can. But I think you have to promise too much at the beginning because you know that you’re going to lose a lot along the way. And the responsibility for dealing with those compromises falls to you as client advisor? It depends on the personalities. Some school governors, for example, work very hard to make things happen. Interestingly, the head teacher I’m working with at the moment seems much more pragmatic. Despite having a lot of vision, she can quickly read a situation and will decide not to fight a particular battle. I imagine that’s because there’s too much else going on. Do some head teachers tend to have unrealistically high expectations about what they can have? I don’t think they have unrealistic expectations. I’ve worked with a lot of head teachers and they can vary a lot but on the whole they are extremely capable people within their sphere and they are very good at managing processes. Whether they’re good at managing people is some times a different thing. They’ve risen quite high up the ladder and the teaching profession is quite hierarchical, isn’t it? So I think they’re very good at getting their own way. What they sometimes misread is the idea that the more noise you make, the more of what you want, you will get. And so they sometimes continue to make more noise, even when that isn’t working. How do you keep hold of the things that you really want to keep from the original briefing with the school? The more I do it, I realise there’s a way to do it, which can get lost sometimes. If you start by having a rigorous checklist of the most important briefing requirements that you tick off at every stage, then you might make sure you don’t lose the most important things. Sometimes, in an effort to make a school building, for example, three storeys high or to have every class south facing, you’ll lose something else, like the corners in the classrooms. Sometimes the really important things get lost because they aren’t discussed and get forgotten. As an example of something that is often lost or forgotten in school design, what about the visibility of the whiteboard? That’s very often an afterthought. There’s a sort of obsession with retaining as much floor area as possible and although it’s absolutely brilliant to get as much area and space as you can, it doesn’t always result in the best design. So what do you do when things that are important to teachers are lost or forgotten? I’ve realised too late in many cases. You can always do things better. Often my starting point has been to fight for as much space possible because when a school has space, they can always use it for something else later. But there are certain orientation and storage space issues that often don’t get addressed at an earlier enough phase. It is really important to start with those structural visions though. Beginning with a structural vision of how the education process can work is far better than starting with an abstract design because it has a reason, it has a purpose. So the vision can become the abstract design: a beautiful concept. If you could change one thing about schools overnight, what would it be? You might be think it would be an architectural thing but it’s to do with the divisive nature of schools. There’s a lot of rigour in schools about managing and process and not about children and that is what I’d change. And architecture can contribute to that but it can’t undo it in the end because the structural vision is a very strong factor. How can architecture contribute? By making different kinds of spaces? Yes, but the spaces, as they say, have to really want to change. It takes people as well as space to do that, to stop putting up walls and dividing people. Yes, I’ve worked a lot with special schools and there is a massive amount of variety of spaces in those schools that they requested and were provided with. It’s all about individualism and paying attention to the children as individuals. Little, individual spaces were important right at the beginning of my architectural career in schools because the first school I worked with wanted to create various small spaces for withdrawal that weren’t part of the classroom. It was quite a successful project in the end – it was about making something different out of partially wasted space. My pitch for that job was about making spaces in corridors with little pull-down seats and at that point I had no idea of the group room function in schools and no knowledge of primary schools. But after five minutes of talking to the head teacher I realised I needed to rethink. But that interest in group rooms and withdrawal spaces and break-out generally has stayed. Those in-between spaces are important. 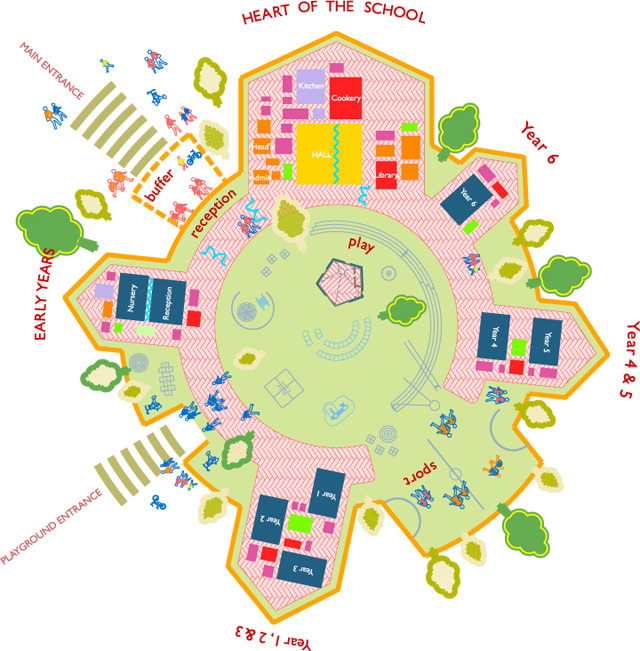 If you were designing your ideal school, with no constraints, which elements would you include? Obviously it depends on the age group, but for a primary school I’d want a partial indoor/partial outdoor space, a shared space – so no silos for thirty children. A lot of shared space and a lot of small spaces: micro and macro, let’s say. You’ve had an unusual education, combining literature and architecture – has your love of literature and language brought any transferable skills to your architecture practice? I’d say a delight in whimsical space. And I can write in a way that most architects can’t. That is important: the communication of your own ideas and of others’ ideas. I’ve also got a lot of architectural knowledge. Having that background in literature and architecture has kept me well employed: I’m not out of fashion!